At a loss for what to serve for lunch today? Look no further. Korean bulgogi beef is usually made of finely sliced rib-eye that marinates for hours before flash frying. This dish is similar…to that last step only. I took out the meat and the hours of marinating and was left with a tasty vegetarian main dish that is highly adaptable and could be added to a rice bowl, wrap or hearty salad. Ready in less than 10 minutes so its perfect for lunch or dinner! Pan fry plain tofu in a dry, nonstick skillet over medium high heat until browned on all sides. While tofu is cooking prepare marinade by dissolving sugar in soy sauce and then adding sesame oil, garlic, ginger and hot sauce. Add cooked tofu and chopped mushrooms to marinade and let sit for 3-5minutes. 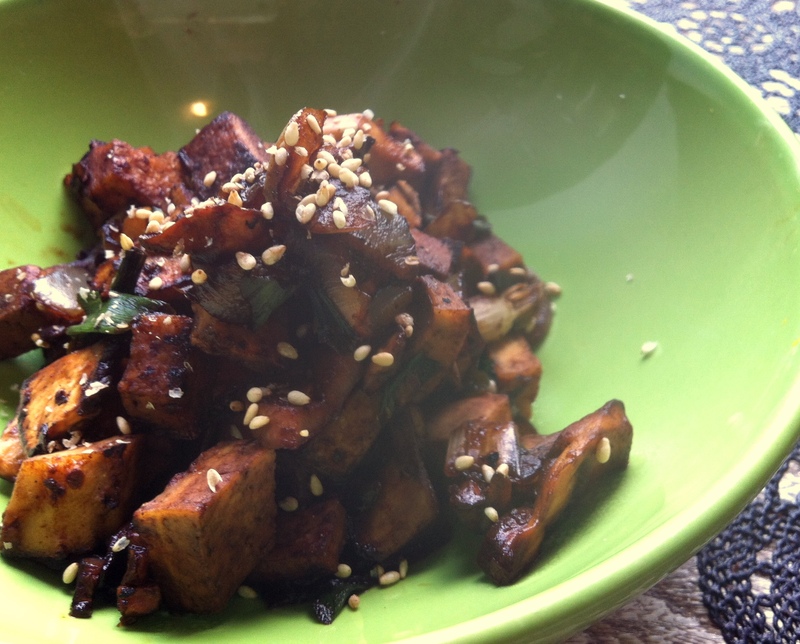 Return tofu and marinade to the skillet pan and cook on medium heat until liquid is dissolved and mushrooms are fully cooked. Add green onions during the last minute of cooking and stir well to combine. I served mine over steamed broccoli and kale tossed in a liberal amount of flax oil (this is my favourite combo) and then mixed with saurkraut (my in-a-pinch substitute for kimchi). Then I paired it with some leftover Japanese pumpkin (kabocha squash). This looks delish! I’ve been pondering how to veganize the whole Korean BBQ experience lately and this is a mouthwatering reminder to get on it!